German structural engineer Professor Jörg Schlaich has created a solar thermal plant capable of generating 200MW continuously. 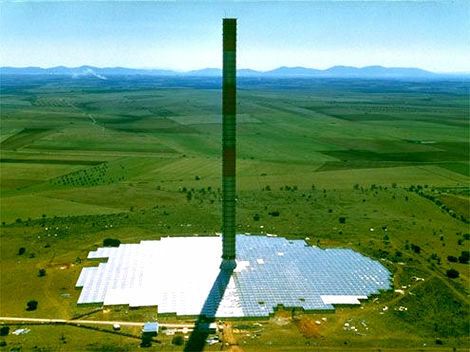 By creating a large volume of heated air underneath a thermal blanket and letting it rise naturally upward through a tall tower with turbines, the Solar Tower will provide power to 200,000 homes, offsetting 900,000 tons of greenhouse gas emissions. "200 MW Solar Thermal Power" was written July 4th, 2008	by TerraformEarth, and filed under Uncategorized and tagged australia, Derrick Williamson, renewable energy, solar power, thermal power.